Born 1956 a westerner her whole life,The call of the Grand Canyon lures Linda back to its unending beauty and long vast views that stretch out miles of temples, peaks and plateaus. 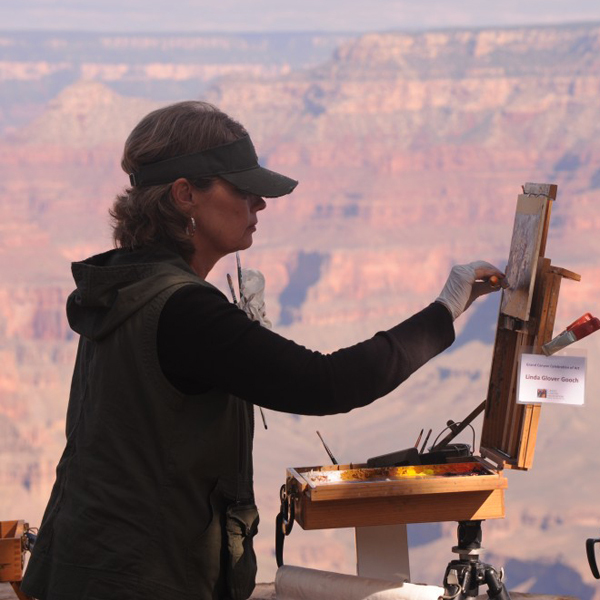 Several trips and many hours on the rim of the Grand Canyon have made this location one of Linda’s most favorite painting destinations. With each trip brings new inspiration as each day demonstrates different light and weather conditions on the canyon vistas. The grandeur and ever-changing moods of the canyons of the southwest are a constant source of study and an important part of her continued growth as an artist. Linda continues to share her enthusiasm by teaching at the Scottsdale Artists’ School. Major exhibits include: Three years in the Grand Canyon Celebration of Art, Grand Canyon, Arizona, with 2011 giving her the Judges’ Recognition Award for Body of work and six years to participate in Desert Caballeros Western Museum’s, Cowgirl Up! Art from the Other Half of the West. Memberships include: Signature Member of Oil Painters of America with participation in nine National shows; a Master Signature Member of American Women Artists, in which she resided as President in 2006 – 2007; and a Signature Member of Rocky Mountain Plein Air Painters. She has been featured in Art of the West and Southwest Art magazines and is represented by Lee Youngman Galleries in Calistoga, California and The Lawrence Gallery in Scottsdale, Arizona.